This is a batch of biscotti, which is technically not a cookie at all, but rather a biscuit. However, it has always been part of my Christmas cookie baking timeline whenever the mood hits me to bake Christmas cookies. Did you know that biscotti is the plural form of biscotto? The word biscotto originates from the medieval Latin word biscoctus, meaning twice-cooked/baked. So there you have the secret of making a batch of biscotti. You make two long loaves of dough, bake them, let them cool a little and then slice them and bake them again. The second bake actually hardens them up a little so that they last a little while longer than a normal cookie does. 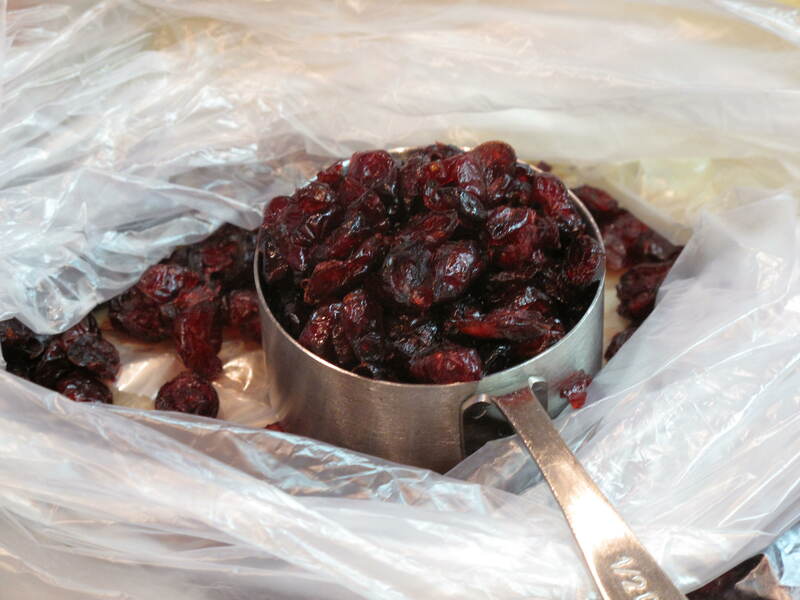 Their hardness also makes it a favorite for dipping into coffee or tea. That’s another reason I make them. The holidays at our house see a lot of coffee that is drank on a daily basis. I find it amazing that the people who are older and have the weaker kidneys are usually the ones that ask for the most coffee to drink and a little something to nibble on while drinking. I have not done a scientific test on this factoid as of yet, but I know it would fall out as a solid statement if I did. For each cup poured, many times there is the question “What do you have to dip into this coffee?” Many times they ask this by calling my name and, more than a few times, my name is forgotten and a simple “Hey you!” starts out the request. In the bowl of an electric mixer fitted with the paddle attachment, beat butter and sugar on medium speed until light and fluffy, about 2 minutes. Add 3 eggs, one at a time, beating to incorporate after each addition and scraping down sides of bowl as needed. Beat in vanilla. Add flour mixture, and mix on low-speed until combined. 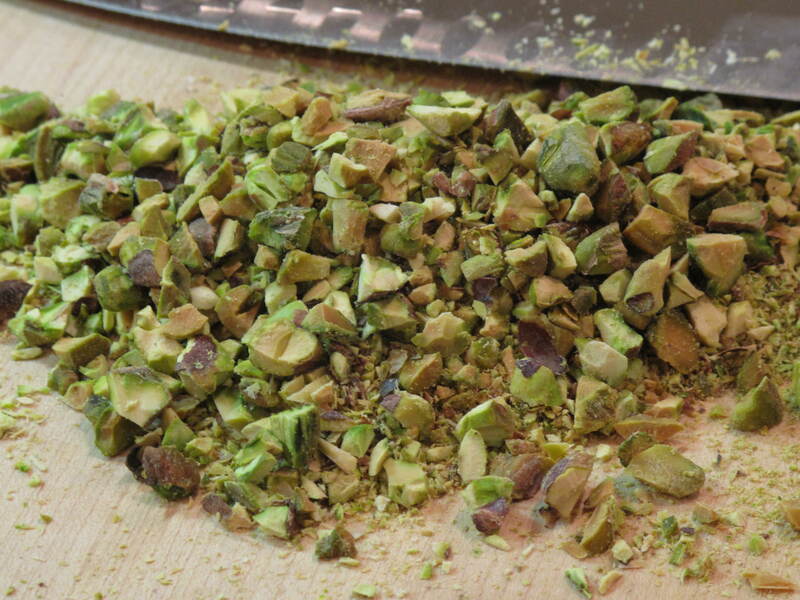 Mix in cranberries and pistachios. Place logs on a cutting board. Using a serrated knife, cut logs crosswise on the diagonal into 1/2-inch-thick slices. Place a wire rack on a large rimmed baking sheet. Arrange slices, cut sides down, on rack. 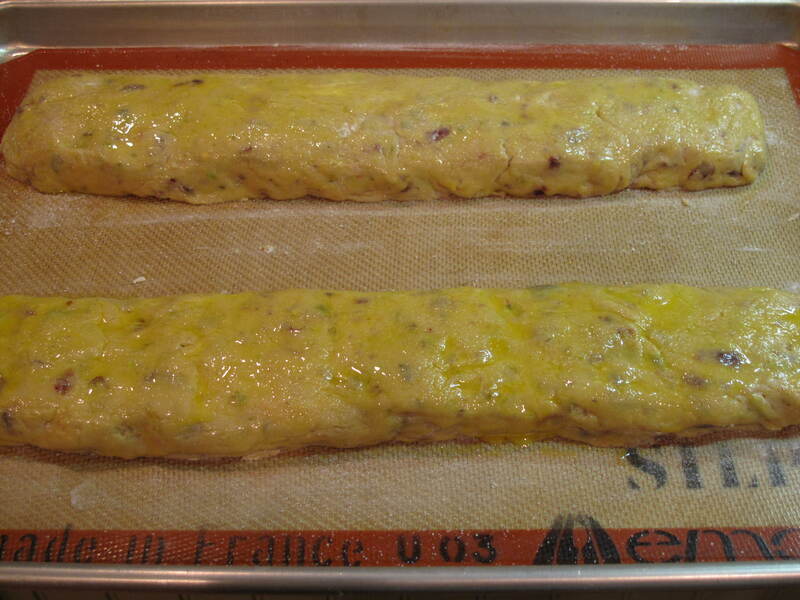 Bake until firm to touch, about 30 minutes. 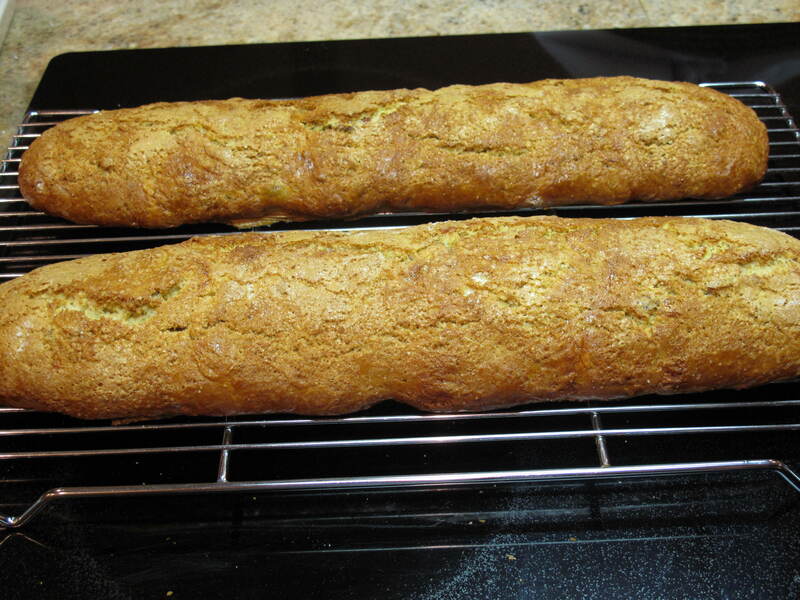 Remove pan from oven; let biscotti cool completely on rack. Biscotti should be kept in an airtight container. 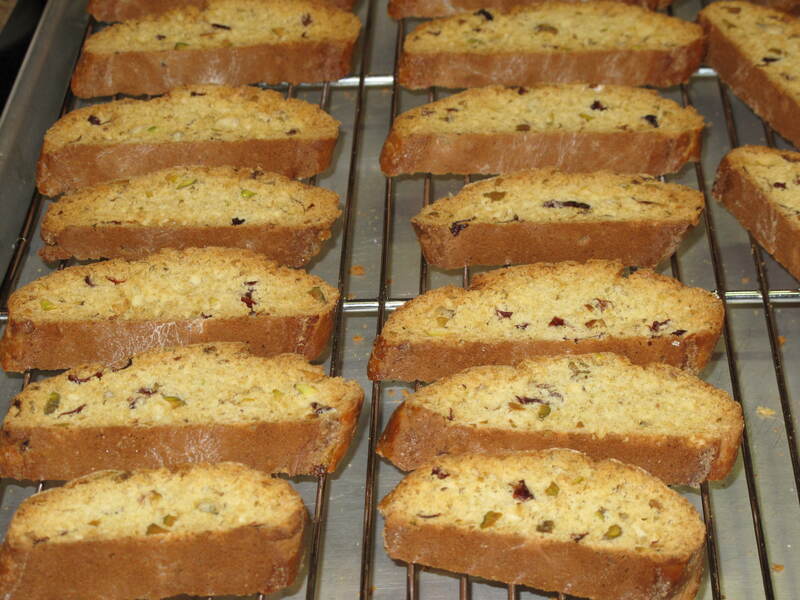 You know you have turned out a great batch when all you hear during “coffee breaks” is the crunch, crunch, crunch of a group of folks gnawing on your cranberry-pistachio biscotti. Thanks for reading about our second cookie made for the season. There will be other posts about our Christmas baking through the big day on December 25. We hope you will come back and “bake” with us. We like the company!! What is your favorite kind of Christmas cookie? This entry was posted in Food, Holidays and tagged Acorns, Baking, Beauty, Blog, Cooking, Dessert, Entertainment, Fall, Family, Food, Fun, Holiday, Italian, Life, Lifestyle, Love, My Life, Photos, Recipes, Thoughts. Bookmark the permalink. Hey You! These look awesome, such a great pairing. Hi Greg. Again, not many left but I always find biscotti so easy to make. It seems it would be a difficult recipe, but it really isn’t. I will probably need to make more over the weekend. Come back and visit soon. Hi frugalfeeding. Tiramisu infused coffee–how good does that sound. Where did you find it? Sounds like something the guests at my house would love. Come back and visit soon. Hi beginsatsundown. Welcome to Acorns On Glen. These biscotti are really tasty and pretty easy to make. Give them a try and let us know what you think. Come back and visit us soon. I always thought biscotti was singular. Now I know better! Thanks. These look absolutely gorgeous and they are calling my name. Hi IamSimplyTia. Welcome to Acorns On Glen. This recipe is really tasty..you won’t be disappointed. Let us know how it went if you make the biscotti soon. Come back and visit us.